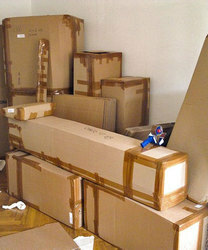 Proper packing guarantees for safe and damage free transportation of products. It cuts down on the likelihood of goods getting broken or damaged while the entire process of transportation. Hence packing is essential in a myriad of moving situations. Our Packing & Moving services are rendered using proper sized trucks and offer all types of loading unloading transit insurance, escorting and Unpacking services. We assure safe and secure delivery and relocating of the client's goods. We provide all types a packaging of different goods.